Malcolm McLean and Keith Tantlinger developed the first container specification in 1955. It was an 8ft wide by 8ft tall by various 10ft lengths box made of 2mm thick corrugated steel. The ‘genius’ was in the design of the external corners that made for easy stacking and lifting (using a standardised twist-lock mechanism). The patent was ‘given’ to the world for free in order to increase adoption, but it took until 1961 for the International Standards Organisation (ISO) to finalise global standards for containers. It is estimated that between 2,000 & 10,000 containers a year fall off ships and are lost at sea. This can be dangerous to shipping as they don’t always sink, but float very low in the water. In 1992 a 40ft container full of plastic toys (frogs, ducks etc.) fell into the pacific ocean with the toys taking some 10 months to start to drift ashore on the Alaskan coastline. 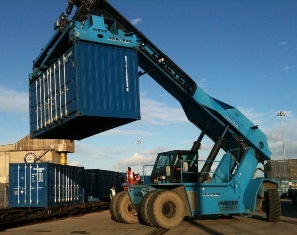 (source: CS Shipping Containers).